Product information "Irish Linen Shoestring Pocket Square - White / Forest Green"
Green is always great for adding a little element of surprise to a serious business outfit or to complete a more sportive combination. Serving suggestions: mid-grey suit, white shirt, brown/green grenadine, this pocket square, navy socks, dark brown halfbrogues. Or something less formal: brown sports jacket, light blue shirt, burgundy/green repp tie, this pocket square, light grey flannels, bordeaux socks, suede shoes. 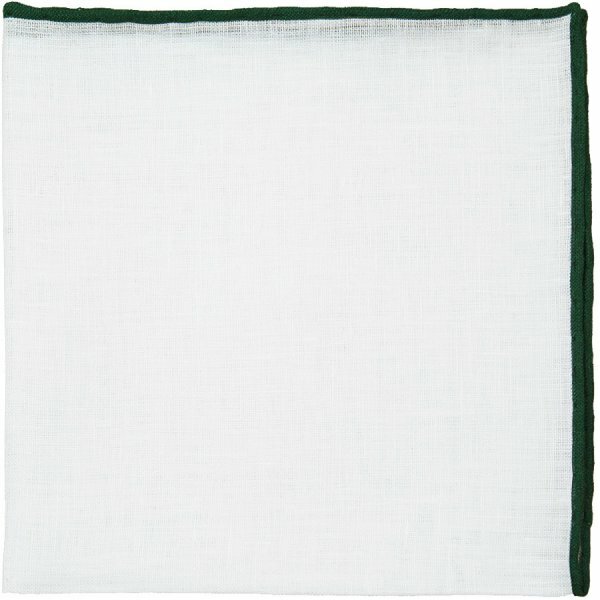 Related links to "Irish Linen Shoestring Pocket Square - White / Forest Green"